Evolution is, if nothing else, an almost magical thing. It will take whatever environment the universe might concoct and fill it with all manner of life, each one perfectly suited to conditions that we here on Earth might look at and go, "no damn way!" So, when headed out among the stars, each planet you come across might be simply loaded with all manner of creatures. And that's just what Legendary Games is giving you stats for (for Starfinder and 5th Edition) in their Alien Bestiary. The book is up on Kickstarter now. 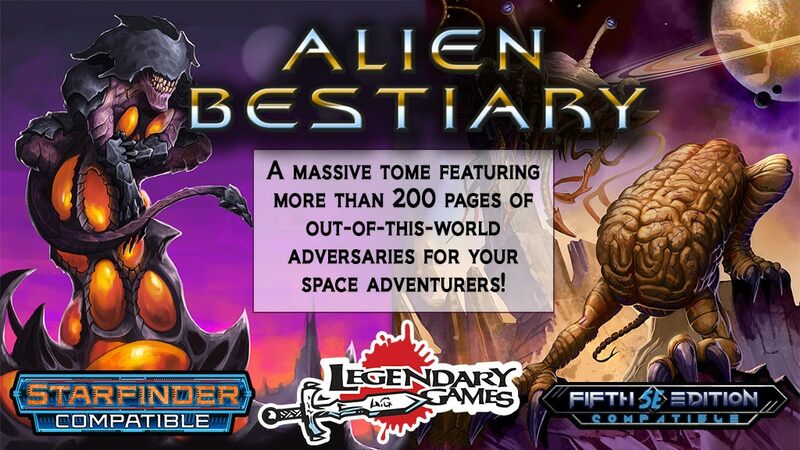 The epic Alien Bestiary Kickstarter for Starfinder and 5E is here from Legendary Games, with over 200 pages of awesome alien adversaries, extraterrestrial enemies, and interplanetary playable races, and that's just for starters! Stretch goals abound, pushing this to 300 and beyond, plus adding bonus companion books like the Alien Codex, Aethera Field Guide, and more! The Kickstarter campaign is already over its funding goal, so it's on to stretch goals for the next 24 days.